The central North Island city of Taupo is a popular year-round mecca for fresh water sports lovers both foreign and local. Boasting New Zealand’s largest lake by a considerable margin, Taupo is blessed with a serene panorama of gentle hills surrounding a huge pristine sparkling blue expanse of water. Around the lake, the temperate forests offer hiking and mountain biking to suit all types of skill level and style. And just north of Lake Taupo you’ll find the country’s most visited natural attraction – the roaring Huka Falls, which tumble over a cliff at a rate of more than 220,000 litres per second. While Lake Taupo is an excellent spot for water skiing, paraponting, skydiving, sailing and kayaking, this area is arguably best known for outstanding freshwater fishing. Just a forty minute drive southwest of Taupo you’ll find Turangi; a town with the reputation for being the home of the largest natural trout fishery in the world. Sitting on the west bank of the mighty Tongariro River, this is the place to cast a line and hook that big one. 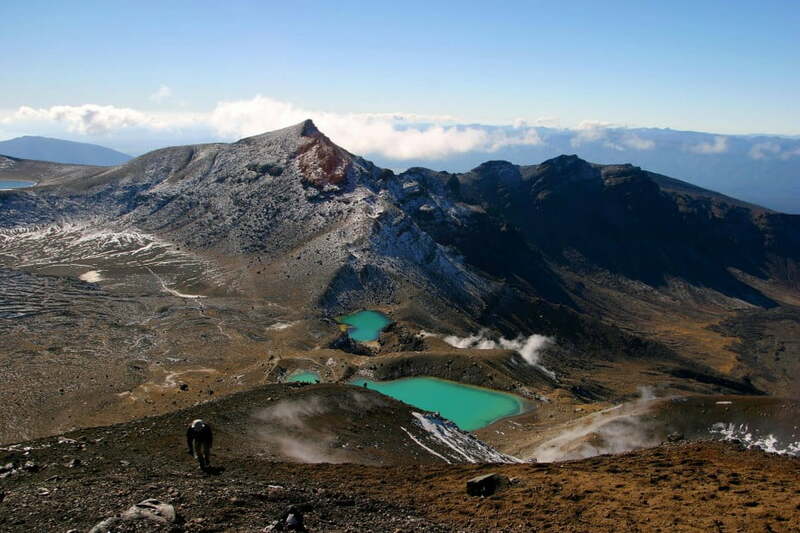 Turangi is also a handy launching pad for exploring the wild and rugged Tongariro National Park, whether it be walking the famed Tongariro Alpine Crossing track, or hitting the slopes at the highly popular Mount Whakapapa and Turoa ski fields. While Lake Taupo is an excellent spot for water skiing, paraponting, skydiving, sailing and kayaking, this area is arguably best known for outstanding freshwater fishing. Just like the nearby city of Rotorua, geothermal activity is also a popular tourist attraction. You’ll find steaming craters and geysers or unwind with a relaxing soak in natural hot pools.